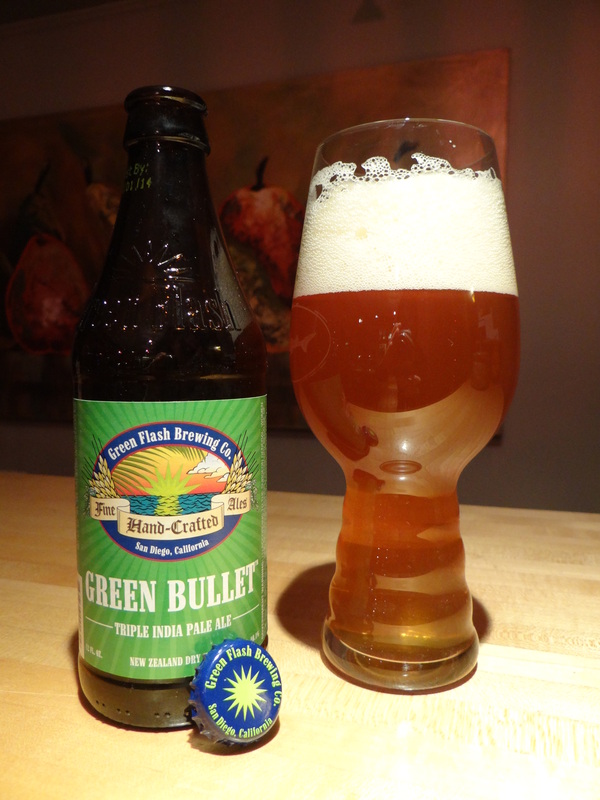 Green Bullet is a new seasonal release from San Diego brewery Green Flash. Billed as a triple IPA it has been on the shelves since September. Although it has been on my list of beers to try, the price and my continuing struggle to warm up to New Zealand hops have made me hesitant to pull the trigger on this one. Not long before Christmas I picked up a single from Weiland’s Market, and last weekend I sat down to give it a try. The bottle had an enjoy by date of 4/1/14 and was consumed on 1/4/14, so it should have been reasonably fresh. The alpha-acid content, which is largely responsible for the bitterness of a beer, of Green Bullet hops ranges from 11 to 14% which is comparable to hops like Chinook and Citra. So I’m expecting an aromatic, bitter beer with a somewhat different aroma/flavor profile than an imperial IPA made with American hops. The beer pours golden-orange and hazy with the characteristic big white head I expect from Green Flash beers. It leaves behind a nice lacing pattern as it slowly settles. As I bring the glass to my face I’m met with an aroma that immediately tells me that I’m dealing with something different than your typical hopped up West Coast IPA. The nose is fruity and floral as expected, but I’m finding it difficult to find the right words to capture the aroma. The pine is definitely there but to my nose the fruits smell closer to mildly sour white grapes (white wine?) than the mangos and pineapples promised on the bottle. Coming to the taste the New Zealand funk party continues. There is a decent amount of bitterness, but not a shocking level like you might expect for a triple hopped IPA with 100+ IBU. The malts add a decent amount of body but in terms of taste they are completely overshadowed by the hops. I can pick up the slightest bit of onion from the hops on the finish. The 10% abv is dangerously well hidden. The mouthfeel is viscous and resinous from the high level of hop oils. Like my previous forays into beers that showcase New Zealand hops (Kiwi Rising by Jacks Abby, Superconductor by 8 Wire, and Nelson Imperial IPA by Widmer) I’m finding it hard to love this beer. It grew on me a little the more I drank, but that usually happens, especially with 10% abv beers. In the end I was glad to have tried it, but I’m happy that I only shelled out $3.50 for a bottle rather than $13.50 for a 4-pack. Perhaps NZ hops are an acquired taste or maybe my smell/taste receptors are wired a little differently than most of the population. I’d encourage you to check out Tom Aguero’s review over at Queen City Drinks for a somewhat different take on this beer.